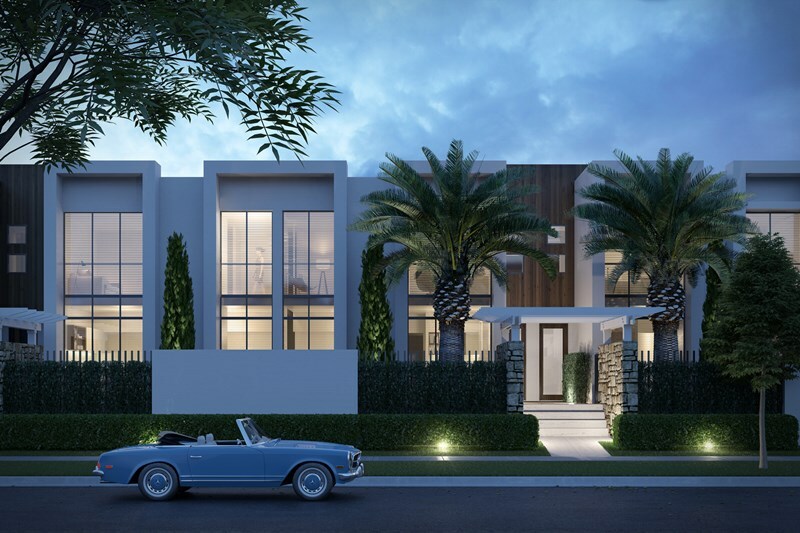 Eton Edition is a yet-to-be-constructed development of 36 x three (3) and four (4) bedroom townhouses. 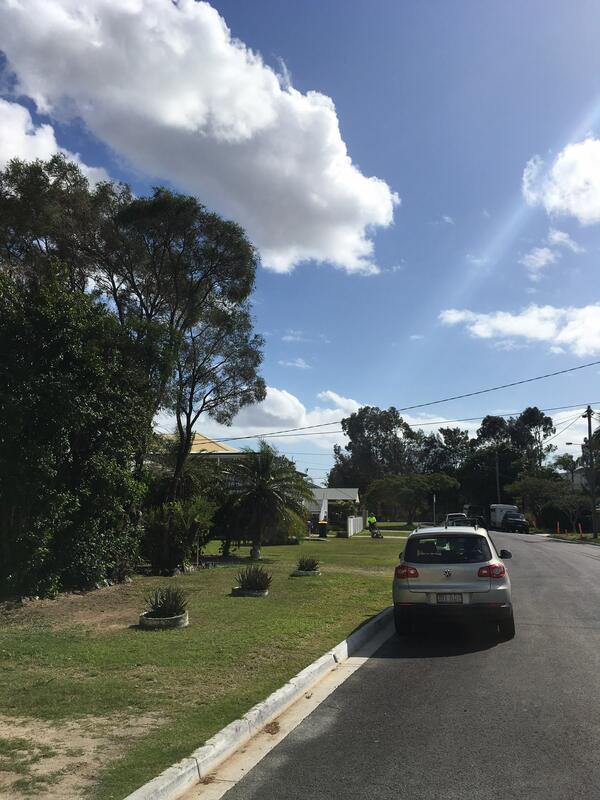 It is located in Hendra which is the next suburb out from Ascot, a highly sought-after suburb in Brisbane’s north. 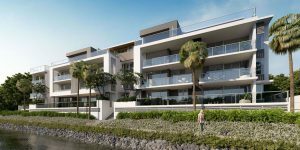 These townhomes will likely be seen as a stepping stone into this area of Brisbane for young couples and families. Or, equally, they would suit downsizers coming into the area. They have high quality finishes and truly nice design inside. They also feature large, modern kitchens with Miele appliances and all townhouses come with two car parks, at least one of which is inside a garage. All townhouse have courtyards and balconies. These townhomes are quite large. 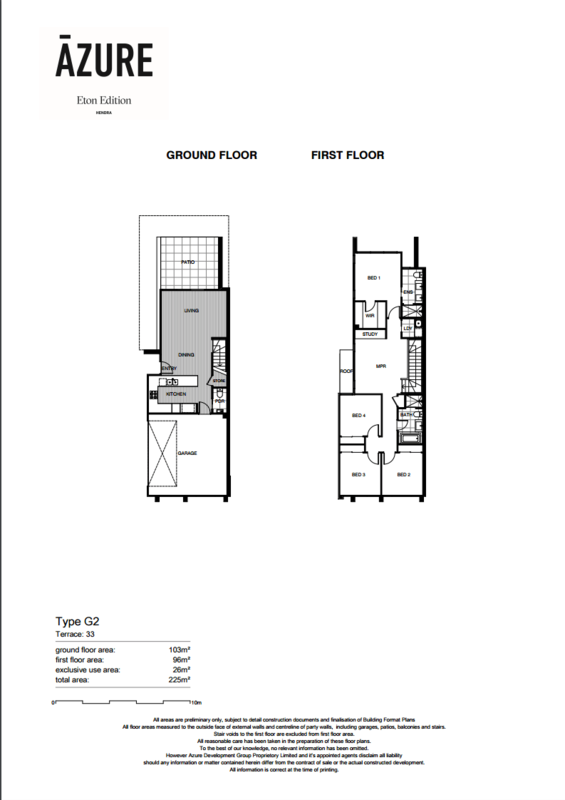 The 8 x three (3) bedroom configurations are all 170m2 internally, with outdoor areas ranging from 29m2 to 35m2. 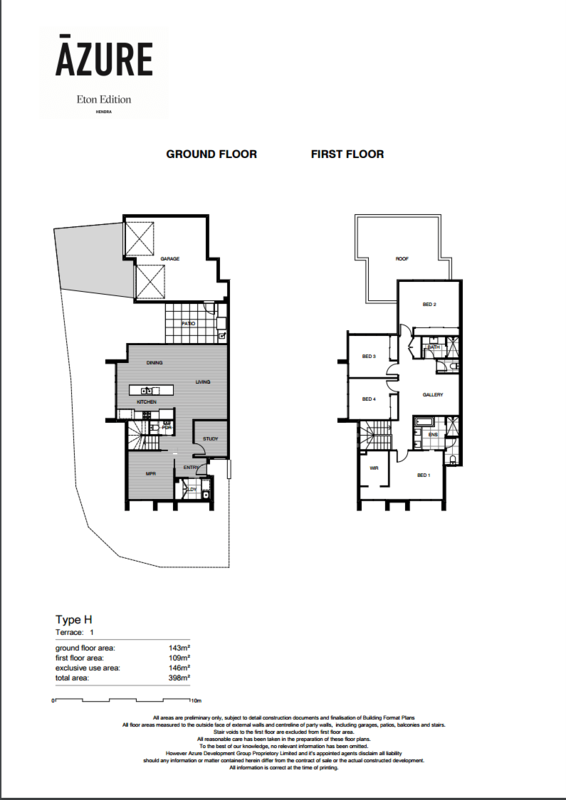 The four (4) bedroom options are between 176m2 and 253m2 internally. 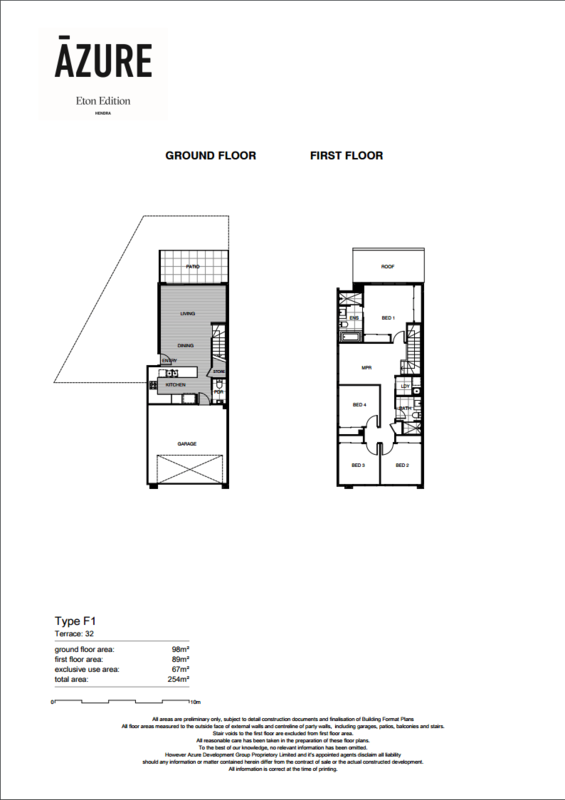 These have between 30m2 and 168m2 of outdoor courtyard and balcony space. So clearly, some of these apartments are quite spacious and livable. Eton Edition is a master planned community with an internal driveway that runs in a loop, giving access to each townhouse. There are two townhomes, H01 and B16, that have a driveways that are accessible from the street. These are also the largest townhomes on offer at Eton Edition. Eton Edition Masterplan. Supplied by developer. In the middle of the ‘looped’ internal road, is a pool area and deck that is for use by residents of Eton Edition. Pool deck render. Supplied by developer. 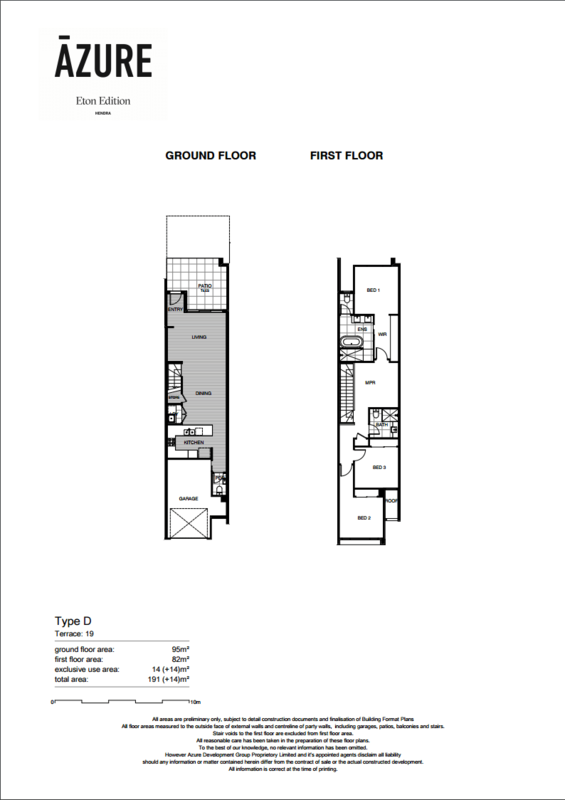 Being quite large townhouses, the floor plans seem quite livable. 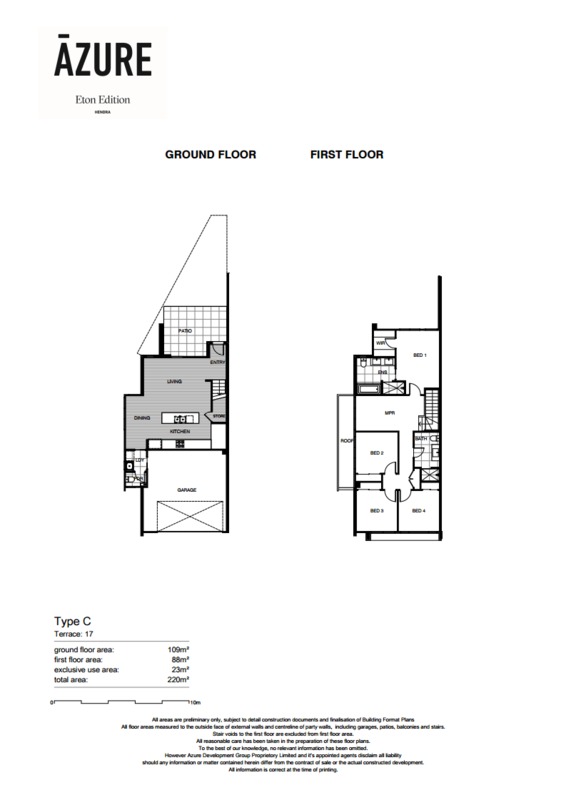 In general, the living area and kitchen is on the bottom floor, with bedrooms and MPR on the top floor. All of the four bedroom houses have an MPR which would likely be used as an extra TV or play room for kids. 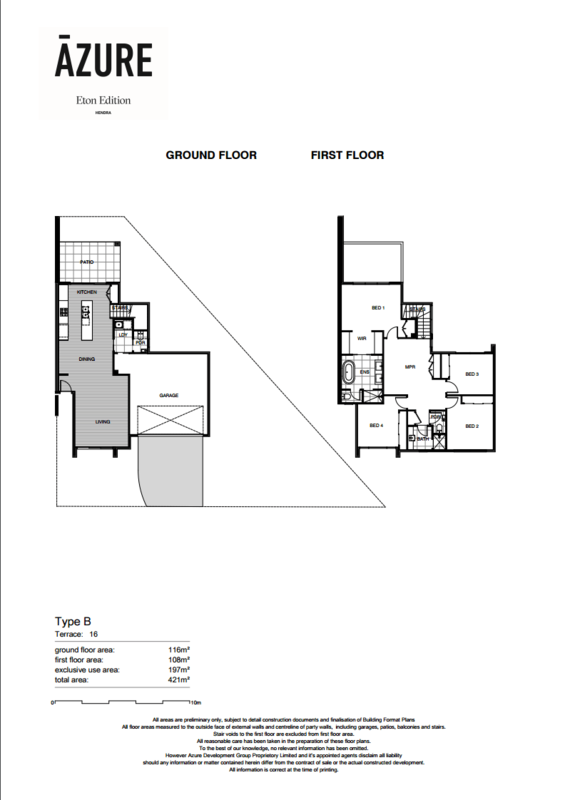 It wouldn’t really be suitable as a study or anything that requires privacy, it is more like an extra living area on the top floor in between all of the bedrooms. All of the downstairs living areas are accessible from either the garage or the front door and they all have powder rooms. All of the kitchens are either ‘U’ shaped or have islands, which is what you would expect in a genuine home as opposed to a rental property. 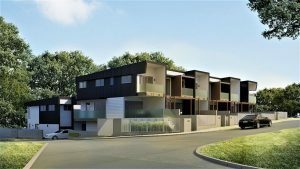 The top floor areas of these townhomes have a master bedroom with ensuite and two to three other bedrooms and a bathroom. With the exception of the master bedroom, the bedrooms are quite small and right up against each other. This may feel cramped for a family with multiple children, however that is when having the added outdoor area and deck space really comes in handy. 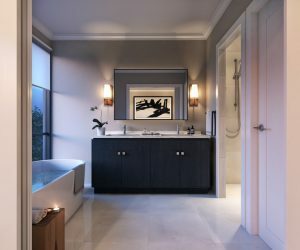 Some of the master bedrooms in the larger configurations have walk in robes and a bathroom with dual sinks and a bathtub. 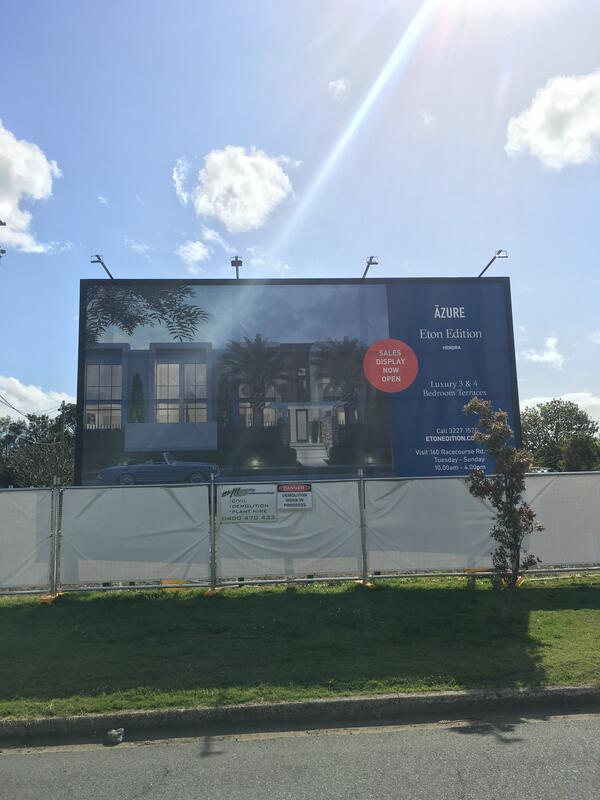 Eton Edition is located at 44 Crescent Way in Hendra. This is a quiet suburban street, populated mainly by freehold homes and a few townhouses. There is very limited through traffic in this neighbourhood and plenty of street parking for guests. Quiet suburban street. Photo taken 17/08/2016. Crescent Way looks and feels like a quiet suburban street, however Eton Edition backs onto Southern Cross Way motorway. It is separated from this motorway by a wooden sound shield. The only way that you would know the motorway exists is from the dull hum of cars in the background. Property Mash visited the site at around 10am on a weekday and the noise from this road was not too bad. However, we would recommend heading on site and having a listen at peak times if noise is something you are particularly concerned about. White construction hoarding in the foreground with the wooden sound shield behind. Beyond that shield is the motorway. Photo taken 17/08/16. Hendra is a northern suburb of Brisbane. It would be considered ‘middle ring.’ It is the next suburb out from Ascot. 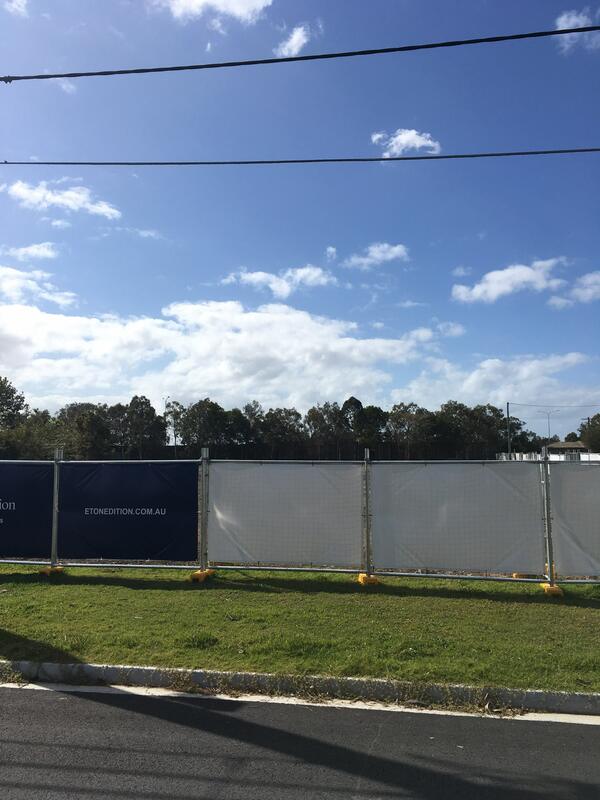 Many people are attracted to Hendra because it is next to Ascot, which is a highly sought-after part of Brisbane. It is home to many large, exclusive residences. The location of Eton Edition on Crescent Way is great for young families. 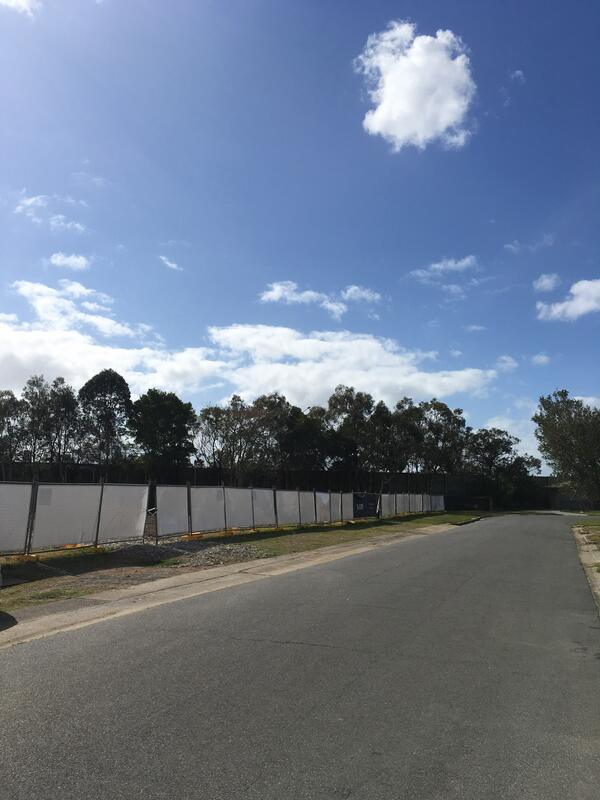 Hendra State School is only 5 minutes walk away. This walk does not cross any major roads, something parents would appreciate! Next to Hendra State School is a small cafe. There is a post office there as well. Another benefit of this location is being a 5 minute drive from Racecourse Road in Ascot. There are many restaurants and cafes on this road, as well as the nearest Coles supermarket. 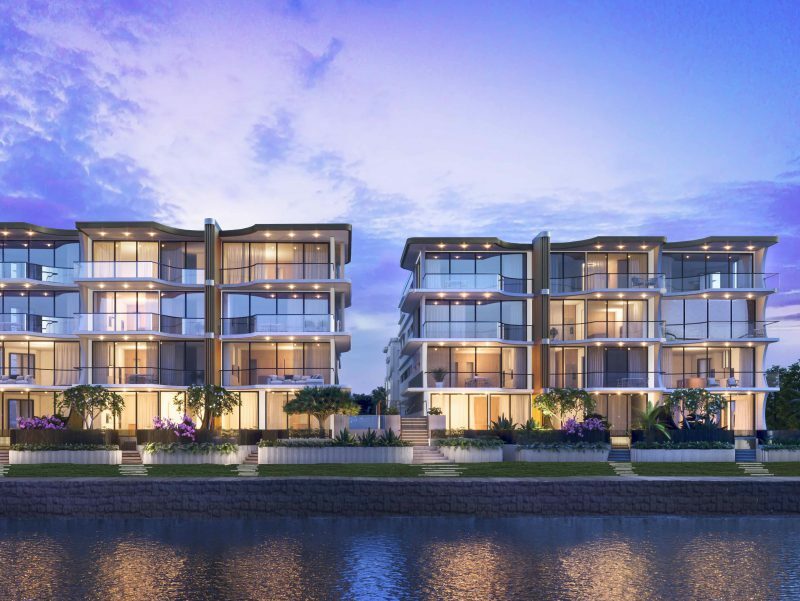 Portside Wharf is also only 5 minutes drive from Eton Edition. This is home to the famous Eat Street Markets, as well as several highly regarded riverfront restaurants. There is a bus stop 100m from Eton Edition. The 301 bus comes to this stop and runs into the city every 20-30 minutes. It takes around 30 minutes to get into Adelaide Street from here. The nearest train station is at Hendra. It takes 20 minutes to walk here or 5 minutes to drive. This station is 20 minutes from Central Station. Hendra has a population of 4,411 people. The population grew by 7% between the last two Census dates. Demographically, this is a suburb that is home to young families – the predominant age group is 0-14 years, follow by 45-54. Hendra’s neighbouring suburbs include Ascot, Eagle Farm, Nundah and Clayfield. 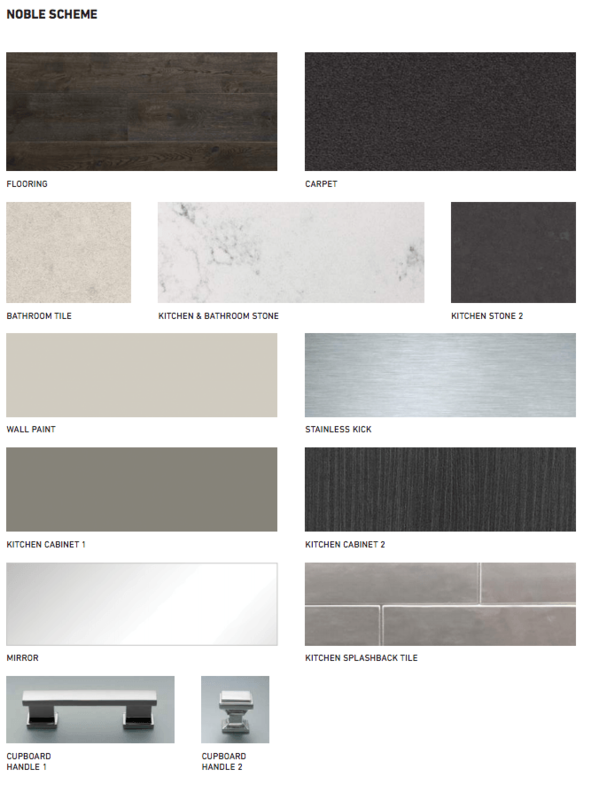 The townhomes at Eton Edition are definitely a cut above the standard in terms of finishes. They have a great sales display set up in Ascot that makes this pretty clear. 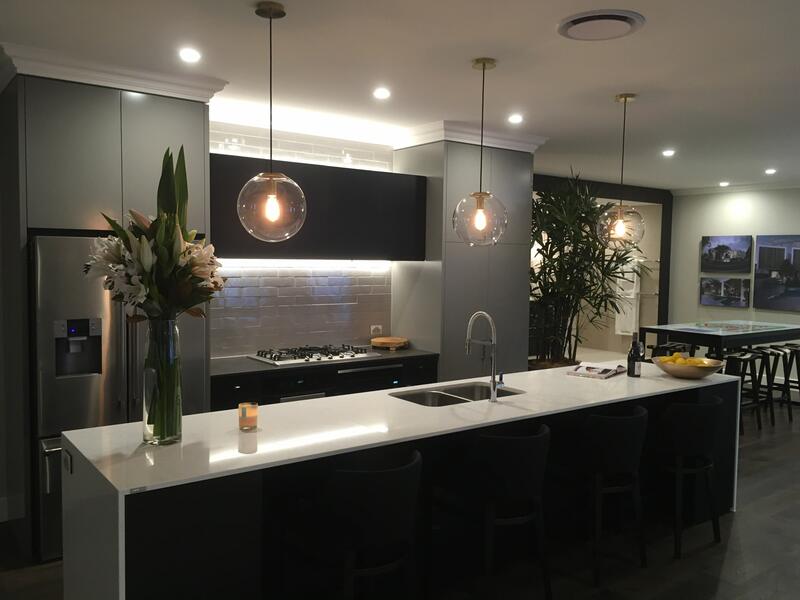 We definitely think it is worth paying the display a visit because it really show cases the inside of these townhouses – from the quality of the finishes to the nice colour tones. 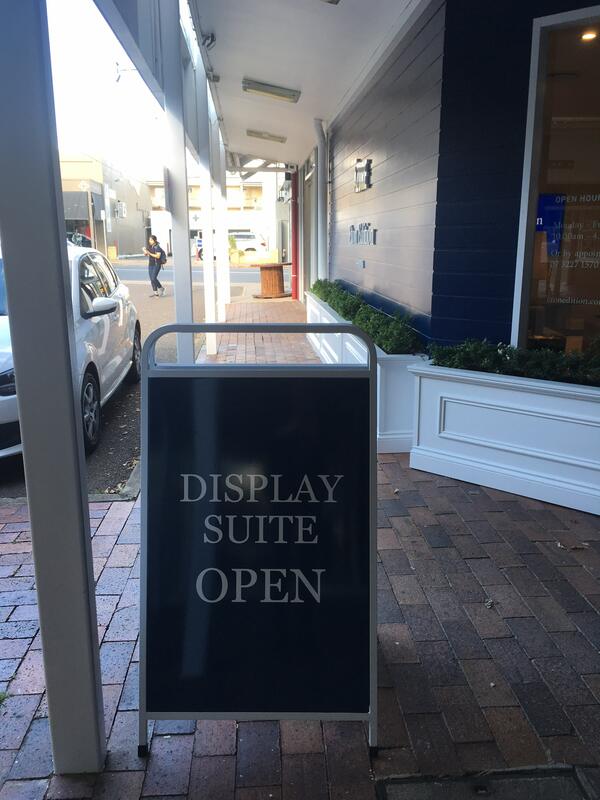 Entrance to the sales display. Photo take 17/08/2016. 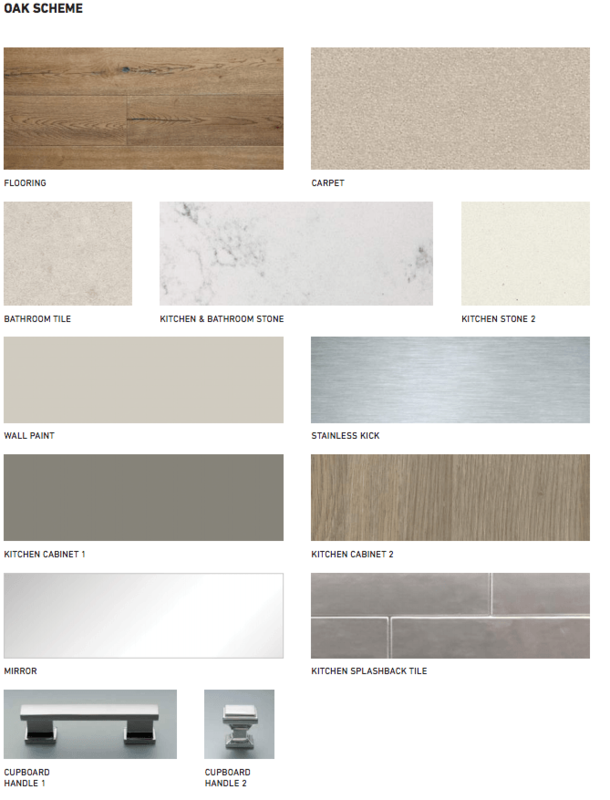 Buyers can choose from two colour schemes – Noble or Oak. Noble is a dark colour scheme and Oak is more neutral. The sales display is fitted out in the Noble scheme. These townhomes have oak timber flooring throughout the kitchen and living areas. This is a more expensive flooring option but it looks great and it is high quality. In the Noble Scheme it is a dark stained timber, whilst the Oak scheme is more natural. An indicator of the quality of this project is the quality of the skirting boards and architraves throughout. Again, going down to the display will show you that the developer is determined to have these finished as a good quality home. Timber flooring inside the sales display. Photo taken 17/08/2016. One thing that you notice right away when you step into the sales display is the white-tiled splashback with grey grout which is highlighted by hidden LED lights in the rangehood cabinet above. Although having white tiles is becoming more and more common as a splashback option, these look quite sophisticate in the context of the kitchen. The pendant lighting above the kitchen island adds to the look as well. The kitchen appliances are all Miele – microwave, dishwasher, oven and five burner gas cook top. 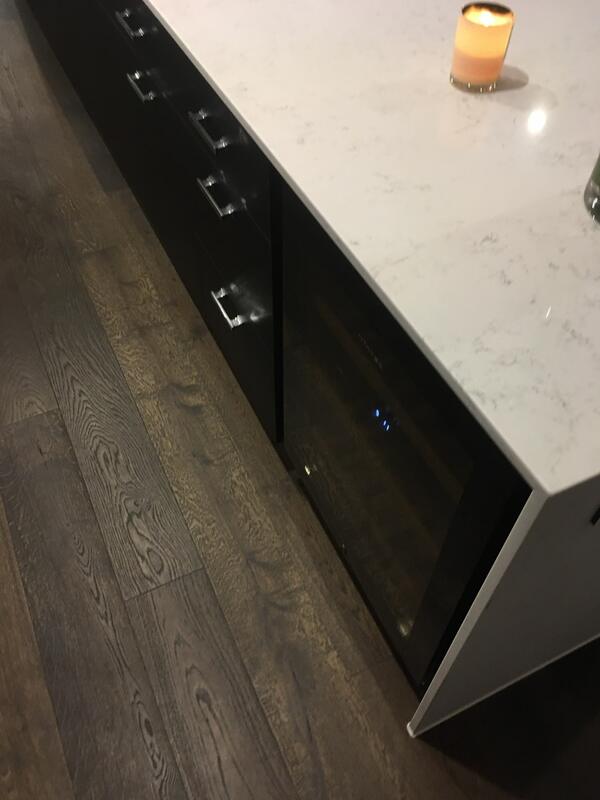 The dishwasher and microwave are both integrated into the cabinetry as well. Kitchen inside the sales display. Photo taken 17/08/2016. A nice feature about the bedrooms is the built in robes. Some projects that have lesser finishes only provide hanging space in the wardrobes which we feel is quite an inconvenience. Whereas the wardrobes at Eton Edition have built in shelves and hanging spaces. These differ between the walk-in robes and built-in robes. The bedroom flooring is a premium grade carpet. 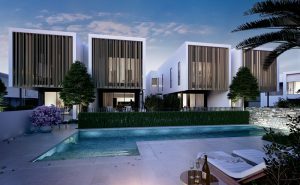 All townhouses at Eton Edition are fitted with reverse cycle ducted air conditioning throughout. Render of a master bathroom at Eton Edition. Supplied by developer. The bathrooms have the same stone and cabinetry that is seen in the kitchens. There are chrome fittings throughout the bathroom and the shower door is semi-frameless glass and aluminium. The annual body corporate rate for each townhouse at Eton Edition is $3,094. 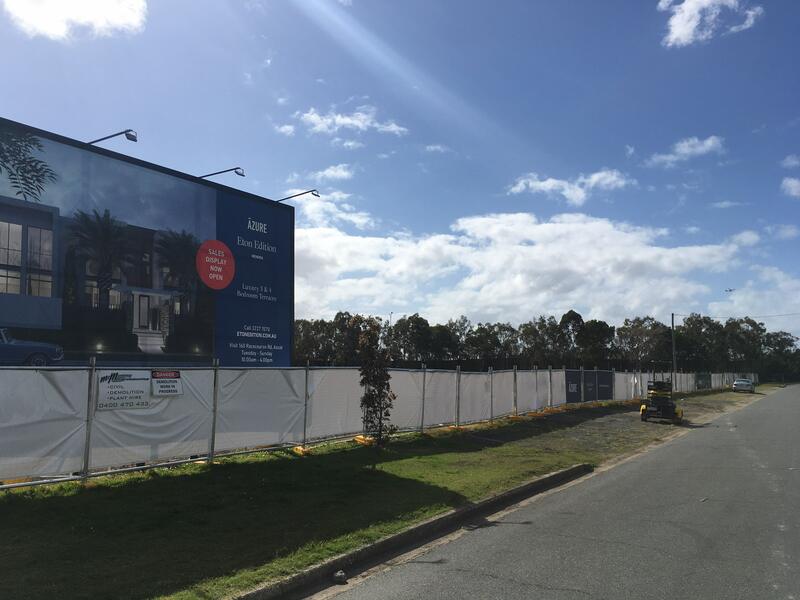 A rental appraisal for this projects shows that the three (3) bedroom townhomes are expected to return between $670 and $690 per week, whilst the four (4) bedroom townhomes could return between $720 and $870 per week. These are all figures for an unfurnished townhome. 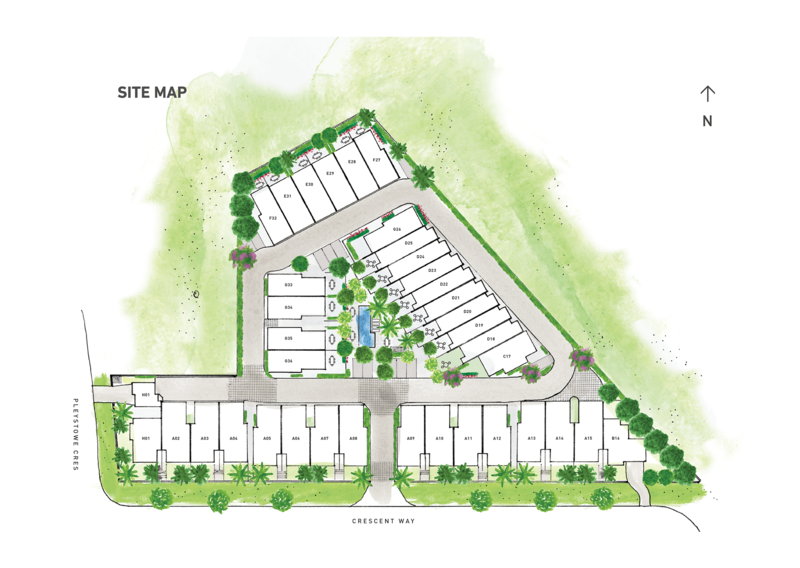 There are no other significant townhome projects in the immediate vicinity of Eton Edition. In fact, there aren’t too many new apartment projects that offer three and four bedroom owner-occupied units. 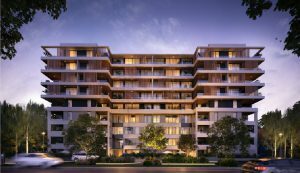 Buyers that are interested in Eton Edition could potentially also be interest in Nido, which offers large owner-occupier apartments in Ascot with city views. 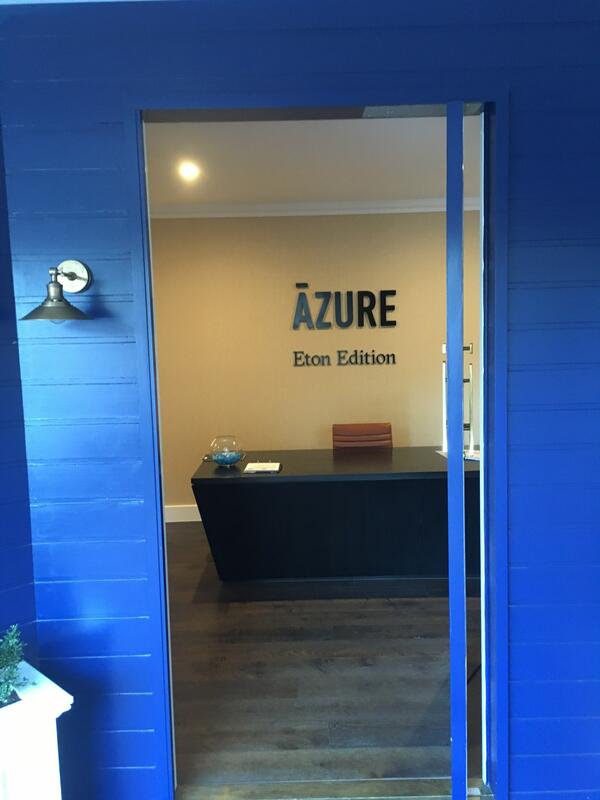 Eton Edition is developed by Azure, a privately owned development company with an office in Brisbane and Bangkok. 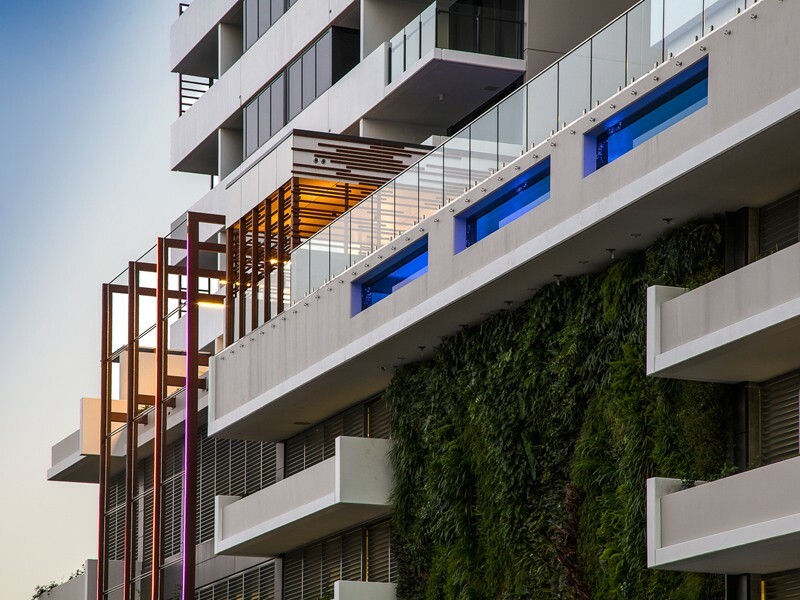 They have completed many projects across Brisbane in suburbs such as Toowong, Chelmer, Kenmore, Sunnybank and South Brisbane. These range from housing subdivisions to apartment blocks. The sales display for Eton Edition is located at 160 Racecourse Road, Ascot. It is open from 10am to 4pm Monday to Friday, or by appointment.